Runner-up Oliver Gill adds to his impressive history in the Aussie Millions 8 Game. Michael Gathy has won the A$2,500 8 Game for A$58,590, only one day after fellow Belgian Bart Lybaert took down the Six Max. Gathy saw off a field of 94 players to take home his first Aussie Millions ring. Meanwhile, Oliver Gill would have to settle for second place, but adds another incredible 8 Game result here to his Aussie Millions poker resume. Gill finished fifth in 2013, fourth in 2016, second in 2017 and was the champion of this event in 2015. With eight players starting the final day's play, Dean Francis was eliminated in eighth place. Earlier this month he finished tenth in the Pot Limit Omaha event, and he would again miss out on the final table, taking home A$9,415 for his efforts. At this point, Benny Glaser was the chip leader, with Michael Gathy not far behind him. Dale Townsend recorded his first Aussie Millions cash since 2016 finishing in seventh for A$9,415, before start-of-day chip leader Glaser bust in fifth, matching the result he achieved in the 8 Game Event last year. This is his second cash of the festival after finishing ninth in the Six Max. Glaser takes home A$14,125. Finishing in fourth place was David Munday who recorded the biggest cash of his career since 2005. Munday cashed for A$19,355. Three-handed it was Gathy who led the way with over 1.1 million chips, Timothy Marsters in second place with 425,000 and Gill bringing up the rear with 302,000. However, it was Marsters who would be eliminated in third, mirroring his result in the H.O.R.S.E. event earlier this festival. 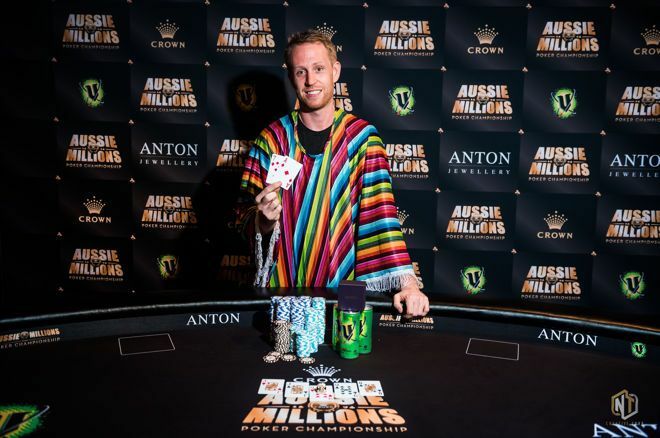 He cashed for A$26,155 bringing his total cashes for the 2019 Aussie Millions to over A$50,000. Gathy held the chip lead heads-up and kept it until securing victory over Gill. This is the second-biggest Aussie Millions cash of his career after finishing tenth in last year's A$25,000 Challenge. This year's A$25,000 Challenge starts on Friday, with live reporting right here on PokerNews, so make sure to come on back for updates.